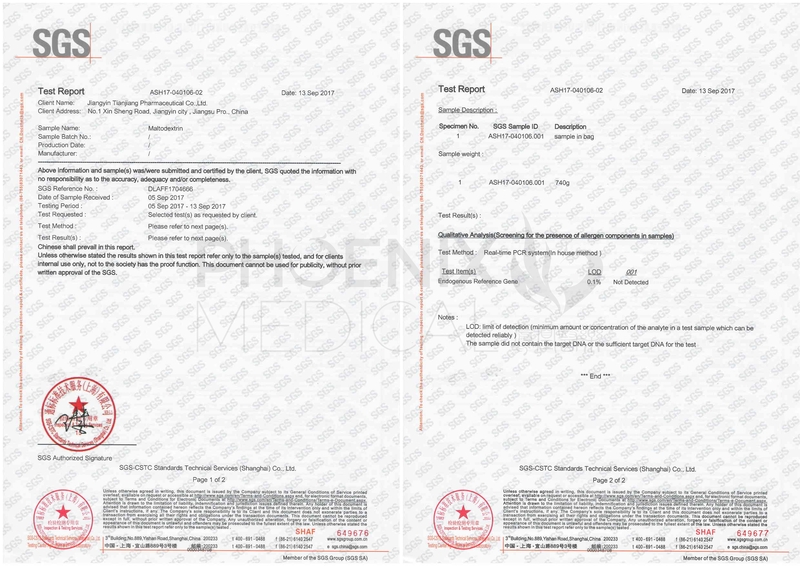 Do Phoenix/Tianjiang Concentrated Granules Contain Gluten? This is an increasingly common question that we get asked. Coeliac disease (coeliac sprue) and gluten intolerance is becoming more and more prevalent in western society. Coeliac disease is an autoimmune condition whereby the body produces antibodies to attack the deaminated gliadin protein in wheat, once it has passed the intestinal barrier. This immune response causes inflammatory damage to the intestinal lining. Symptoms include bloating, diarrhoea, constipation, abdominal pain, wind, nausea, tiredness, intestinal permeability, anaemia, nutrient deficiencies and unexpected weight loss. Gluten intolerance (also known as non-coeliac gluten sensitivity NCGS), is seen in individuals where an allergic IgA and IgG antibody response occurs in response to gluten proteins (gliadin). This can then cause symptoms similar to Coeliac disease such as bloating, constipation, diarrhoea, abdominal pain, depression, muscle and joint pain, brain fog and more. Gluten is a collective name for the proteins found in wheat, barley and rye. Oats do not naturally contain gluten but cross-contamination can occur as grain based products are often manufactured in the same facility. Furthermore, the avenin proteins in oats have a similar structure to the gliadin in gluten containing foods, so coeliac patients are often advised to avoid oats too. 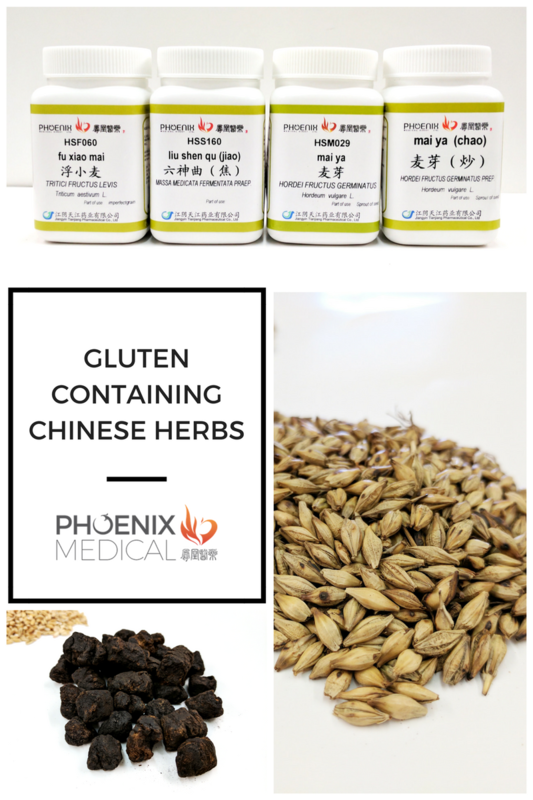 In Chinese medicine, some herbs naturally contains gluten, i.e. 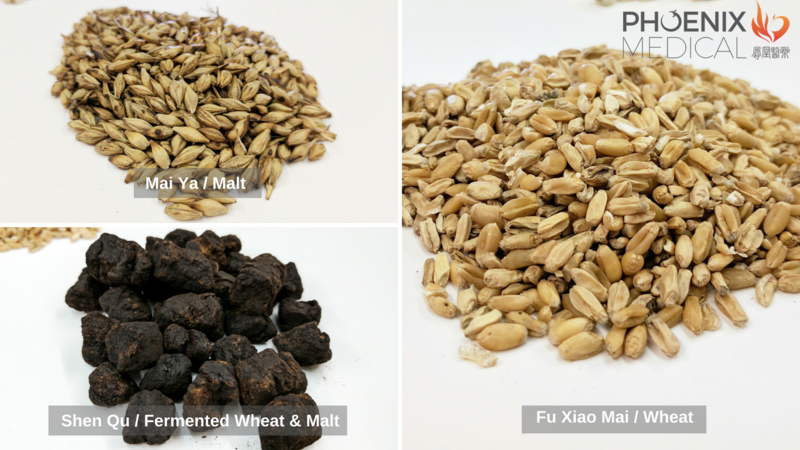 Fu Xiao Mai (wheat), Mai Ya (malt), Shen Qu (fermented wheat/malt).These herbs must be avoided when prescribing for a patient that suffers from Coeliac disease. There are also some herbs that have been processed using a method of PaoZhi processing called 'Fu Chao', which means 'frying with wheat bran'. This method enhances the digestive function of the herb. As wheat bran contains gluten, any herbs that are processed with this method must be avoided if your patient has Coeliac disease. Whilst Yi Yi Ren (Coix Seed or Job's Tears, often mistaken for Pearl Barley) is gluten free, it is one of the herbs that are commonly Fu Chao processed. Please ensure that you use unprocessed Yi Yi Ren. At Phoenix, we supply a range of dry herbs and concentrated herbal granules. With the exception of naturally occurring gluten in the above herbs, our herbal products do not contain any added gluten. Furthermore, our manufacturers operate a strict GMP practice; following processing of each batch of herbs at each step (i.e. washing, decoction, drying), the machines and equipment are thoroughly cleaned and sterilised, therefore we can guarantee zero cross-contamination. Please be aware that other concentrated granule brands on the market use different methods of production and may add varied amounts of CORNSTARCH to avoid clumping from moisture. Whilst cornstarch does not contain gluten naturally, the manufacturers of the cornstarch cannot guarantee there is no gluten cross-contamination, as they may produce other grain based products in the same facility.